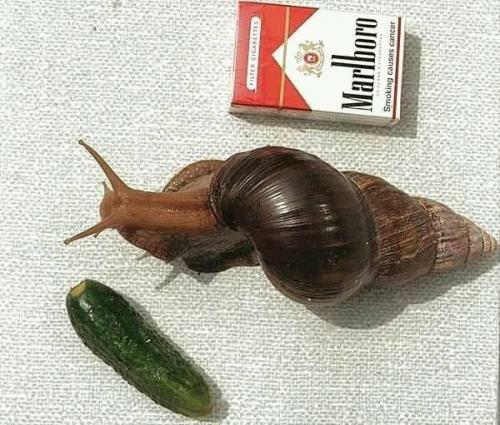 A huge snail faced with a difficult choice! Vinegar or nicotine! What shall it choose! Kind of random throwing a pickle in there for reference. yes, i agree the pickle is not a good reference for scale, as pickles do not come in a standard size. I don’t know what the snail will choose, but I think I’ll choose butter, garlic, parsley and GruyÃƒÂ¨re. On a pickle? That seems a bit excessive. Just eat it. This looks shopped to me. It’s a Giant African Snail. They are illegal within the United States, but the people in the UK can have them as pets. And yes, they are that big. I have two of them, currently they are a bit smaller than that one. Why the hell would snails be illegal? Do they use them for snail fights? No… I’ve seen quite a few shops in my day.